Check- Rusty mountain bikes, squeaky brakes, repair kit, pump, water bottles, Chaco sandals and a torn out Rough Guide map. Missing- Compass, helmets, gloves, topo map and Chleuh Berber language book. 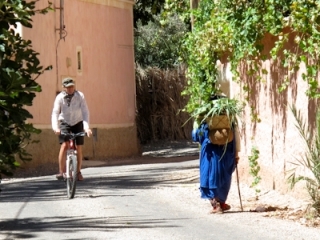 Day one- 40km loop from Tafraute up into the Ameln Valley where 26 Berber villages are built into the pink ridges of the mountains, interconnected by shepherd’s paths. Our torn map with bold lines and small dots connecting these villages resembles an astronomical map. “Take the asphalt north, look for dirt road turnoff, ride below the cliffs into the villages.” We repeat the directions, Got it! Until we find hundreds of trails below the vast array of mountains, an occasional sign in Arabic and Berber. Eying Jay, he nods and we barrel down any rugged path. [smooth=id:1;]Jay plunders over stickers, thorns, bushes tearing up the terrain, all the while I stay true on the lonely shepherds path…. Sizzlesplat.. Jays made a flat. Goats bleating in the background, I take shade under an argon tree while Jay works his tools. These meandering paths connect Berber villages (Oumesnat to Ait Taleb to Tahala) built upon ruins of an ancient people. Djebel el Kest(2359m) serves as a backdrop rising up from the north as we traverse east to west. We ride pass women in these villages, covered from head to toe, faces barely exposed in traditional hamelhof, a silky black wrap with solid bright fringe. Whether working in the fields, transporting vegetables from wicker baskets slung atop foreheads or resting in the shade, these are industrious women. Most men emigrate into the cities for work, leaving the remaining few to sell goods from musty, narrow stalls jetting from the side of the road, further dwindling the population of 1500. A young boy of 7 or 8, who should have been in school, began to take aim with his David and Goliath rock sling. “Bon Jour, Ca Va?” we shout, waving, trying to disarm him; In his excitement, he waved back, dropping his weapon and ran to talk with us. Our rides brought us past Chapeau de Napoleon (Napoleon’s Hat), obviously from the French occupation and the faded Painted Rocks, manifested by a bored Belgian artist and 200,00 gallons of blue paint. Although once a stark contrast, we wondered if the artist would return to clean his mess. Dry and barren, sun over head reflects off the layers of rock that was once a sea. We are hot, exposed and begin covering our heads and arms. Riding on the gorge narrows, and around a tight bend we suddenly enter paradise- A Thousand in One Nights, a mirage. Our first fairy tale oasis appears.. from the narrow valley floor, a spring fed brook feeds lush verdant figs, dates, pomegranates and bamboo, vibrant flower vines ordain rows of palm trees. Riding slowly as if not to disturb the mirage, we drink in the calmness. The oasis fades as the water dries up and the moonscape returns, we lunch on canned tuna and baguette. The road has faded, the oasis villages surly a mirage and our cell phone has no reception, exhausted we keep pushing upward, over boulders and potholes, looking for any signs of life, or any signs for that matter. 5 hours pass and we begin to wonder where our pickup point might be? Did we miss a side road, miles from our starting point? Around another curve, over a horizon sits the trusty white 4×4; Sweaty and dusty with big grins of satisfaction, we load the bikes on top. His expression bemused, shakes his head and drives us back into town. We love this website and your amazing pictures ! Sounds like life is better than good ! ps – Dad says you could use a bigger motorcycle.